BHW has been partnering with Emmanuel Mission for a number of years and various programmes have been initiated. These include a dairy farm (UGA07), the installation of a milk cooler, the establishment of Marumba Christian School (UGA07a), and various Foundations for Farming trainings. Emmanuel Mission has proved to be a very reliable partner and they have worked incredibly faithfully in the various endeavours. A number of new initiatives have been presented to BHW for further partnership. These include boosting a developing loan programme, supporting the development of Foundations for Farming, and a goat programme that will see many families develop small herds of goats. This partnership is to establish a loan fund in Uganda to develop various projects from there, rather than for each one of them to have to come back to BHW for approval and facilitation. The loan fund will be based in Rukungiri. A team of people will oversee the lending and repayment of funds to the central loan fund. Various groups within the Emmanuel Mission network will be able to register as members of the programme. Once they are members, they will be able to apply for loans from the fund. Agreements will be made around term, interest, amount etc. and each of these will be unique. Bright Hope World has been partnering with some young men in Rukungiri in the south west of Uganda towards the DRC/Rwanda border area for a number of years. In 2008 we sent three of them from that area to GLO Zambia for training. Two of those men, Reuben Tumuheirwe and Justus Matsiko, are now based in the town of Rukungiri and are involved in church planting there (Emmanuel Mission). When BHW's Partnership Development Director was traveling with them in 2016 it became clear that there were a number of things going on within Emmanuel Mission that were in need of economic investment or seed funding. They therefore began to talk about establishing a loan fund that would operate within Uganda and be managed by them. As a result of ongoing discussions, in October 2017 the EM Fund was established as a new entity operating within Emmanuel Mission. The beneficiaries are the members of Emmanuel MIssion who organise themselves into groups for the purpose of running programmes that empower people economically and deal with poverty. Many of these people are Congolese refugees who have had to leave their homeland and relocate to Uganda. Another significant group of beneficiaries are the farmers who have been trained in Foundations for Farming. There are quite a number of people in the network who have been trained. It has the ability to help the local leaders develop their capacity. It will empower many new projects among the Emmanuel Mission people. Many of them are refugees and in the category "poorest of the poor." It will mean that the local projects will be developed by local people and there will be less need for BHW to be involved. There are many good people in this network who will be assisted out of poverty. Justus is married to Grace and lives in Rukungiri town. They have one child. When he was five he lost both his parents and was then raised by his grandmother for a short time before being taken to another family. In 2007 he finished his advanced levels at secondary school and then in 2008 he was sent to Zambia by the elders of Rukungiri chapel for discipleship training which lasted for 10 months. Justus is involved extensively with Marumba Christian School as well as being involved in church activities like preaching and teaching the Bible using the expertise he gained from his training at GLO Zambia. He has led various gospel outreaches and has experience in leading and discipling young people. Reuben was born in 1971 and is Justus Matsiko’s older brother. When his parents died at an early age he was unable to continue his secondary education and had to start to do manual work for survival. He has been married to Kemigisha Monica since 2000 and they now have their own children. In addition, Reuben and Monica regularly have lots of extra children living in their very small house and are very generous with their time and care of others. In 2000 Reuben became a Christian himself through the sharing of his other brother Johnson. Since then he has continued to grow spiritually and has been ministering with Rukungiri Bible Chapel for all that time. He travels in the local area and has planted at least 5 other local churches in the Rukungiri vicinity. Life has not been easy for him and his family. Reuben continues to impress with his dedication and heart for serving those less fortunate and his commitment to the gospel. In addition to this he supports himself with a business cutting timber with a chainsaw and the income supports his family, the church and the school. Other people will be brought into the leadership of this loan fund and they are in the process of being confirmed. The vision is to economically empower people within the Emmanuel Mission network. There are many very poor people within the network who are struggling to feed and educate their families. Many have formed themselves into project groups but have no access to seed funding. Mission: To provide financial support and services for Emmanuel Mission Uganda local churches and associated organizations to grow and flourish. 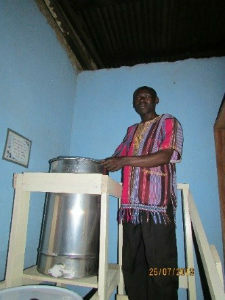 To set-up a central fund that groups can apply to for loans to establish their enterprises. The plan is to initially lend to four existing projects and then to increase the number of projects in the group as the initial funds are repaid. In the future there will be a central fund that lends funds to groups that organise themselves and apply for funding on a loan basis. Eventually there will be numerous enterprises functioning around the country that are assisting the poor to become economically self-sustaining.